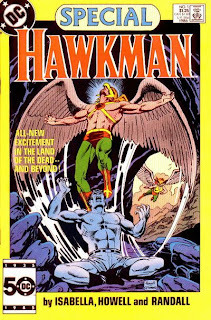 Since DC doesn't seem to want to put up the cover to the first issue of The Atom & Hawkman in about forty years, your Hawk-blogger is doing it for them. Enjoy! Image: The Atom & Hawkman #46, 2010, Ryan Sook. Can we expect to see any Hawk-related merch on the racks of our local comic shops this week? Let's find out! The Atom & Hawkman #46 -- Back from the dead! 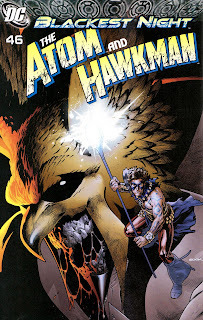 Complete with it's crummy cover logo, The Atom & Hawkman makes a one-issue comeback as part of the Blackest Night skip month. I have only gotten one of these issues (Weird Western Tales), so I am not really sure what to expect, but a showdown between Black Lantern Hawkman and new Indigo Tribe member Ray Palmer seems likely. I don't know what the heck is going to happen after Blackest Night -- I'm terrible at these sort of predictions in the first place -- but I would really like to see some sort of return to normalcy for Ray, who has really been through the ringer since Identity Crisis. Of course, I would prefer to see some normalcy for the Atom and Hawkman, not to mention Hawkgirl and Jean Loring, but I am not going to get my hopes up... if only so that when it doesn't come true I am not too disappointed. Blackest Night #3 (2nd Printing) -- If you missed it the first time, now you can check out the Black Lantern Hawks in all their gory glory in this reprint. Blackest Night: JSA #2 -- The Hawks were not present in the first issue, but they might show up here. Honestly, they really should, considering the connection to the members of the original Society which have risen from the grave in this series. Justice League: Cry For Justice #6 -- Both Hawkman and Hawkgirl have been featured as members of the League in this miniseries, and with the cliffhanger from last issue taking place on the JLA Satelite, I expect them to be part of this issue as well. Also coming out this week is the first issue of the "new" JLA under Robinson, but since that takes place after Blackest Night, I don't think the Hawkfolks will crop up in there. Adding to the "Absolute Justice" hype I posted earlier, Newsarama has posted an interview with the former Fox Crane from Passions and current Oliver Queen/Green Arrow from Smallville, Justin Hartley. Newsarama: I read the official description of "Absolute Justice", but they don't really talk much about what's going on with Oliver. Michael Shanks (Hawkman) has talked about you guys butting heads. Geoff Johns has spoken about a 'shared behavior'. So can you talk a bit about your role in that? Hartley: ...Hawkman and Green Arrow do not get along. They do not see eye to eye politically. [laughs] They don't see eye to eye on any kind of social issue. But yet they're stuck together because they work well together. Sounds like the frenemies relationship we have all come to know and love from these two! More hype for the upcoming Smallville telefilm, "Absolute Justice," this time in the form of the promotional poster. The image features all your favorites -- that is, Hawkman, plus some other folks. If Geoff Johns showed up at my house to watch this with me I don't think I could be more excited about this event. "Absolute Justice" airs February 5th on The CW. 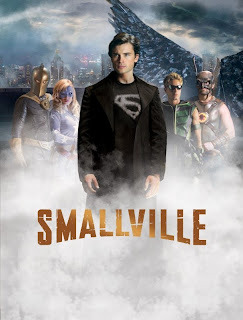 Image: Smallville "Absolute Justice" poster, 2010, image retrieved from Newsarama. More Images From Smallville "Absolute Justice"
From CBR, here is a headshot of Hawkman from the upcoming Smallville telefilm "Absolute Justice." We also have images of plenty of varied Justice Society relics, including Hawgirl's helmet and mace, Flash's helmet, Alan Scott's lantern, and the mural of the JSA, which can be found here. More and more little fan service nods keep bubbling to the surface here, and I don't think I can be any more excited for this even than I am right now. Between this and the previous episode of Batman: The Brave And The Bold featuring the Society, it's a downright Golden Age revival! "Absolute Justice" airs on February 5th on The CW. Image: Hawkman, Smallville "Absolute Justice," 2010, image retrieved from Comic Book Resources. Is there any Hawk-related swag available this week at our respective local comic shops? Let's take a look and see! Green Lantern Corps #44 -- Possible Black Lantern Hawkman and Hawkgirl, or Khufu and Chay-era sightings. Justice League of America: Sanctuary TPB -- Reprinting Justice League of America v.4:no.17-21, this collection by Dwayne McDuffie and Alan Burnett features Hawkgirl during her stint with the team. It really is unfortunate that Mac never got to really flesh out some of his plans for Kendra (as detailed on this blog some time in... yeesh... 2008?! ), because I think it would have done her character some good. Team books are always good for sending characters without solo titles on their own Heroic Journeys, and I think that Kendra could have been rounded out a little bit more from it. Of course that was not to be. Still, this volume looks pretty neat. Justice League of America Special -- This Special is not on the Diamond list but it is on the DC website, and it collects the first issue of volume 4 along with several origin stories from 52 and Absolute Superman: For Tomorrow. I picked this one up when it was new and thought it was a strong launch issue, although history has told us that Metzler's run sorta just petered out. Hawkman Paper Doll by... Alex Ross?! If you ever needed evidence that Alex Ross was not exactly a, uh, tough guy growing up, I present to you these paper dolls of the Justice League of America, including Hawkman! All kidding aside, these are very meticulously assembled litle paper dolls, and the details are great. I was never very good at artsy-craftsy stuff like this, so I cannot even imagine how long it took to do some of the more complex elements, such as Hawkman's helmet! Thanks to rob! for first posting this picture over at The Aquaman Shrine! Image: Justice League of America paper dolls, ??? ?, image retrieved from The Aquaman Shrine. B:TB&TB -- "The Golden Age of Justice!" 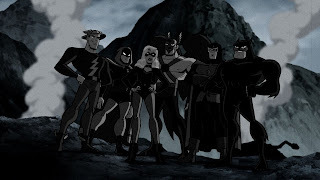 After the teaser, which involves the Dark Knight Detective solving a theft with the help of Detective Chimp, the story proper begins with a newsreel of the Justice Society of America in action in World War II. We cut to the modern day where a JSA appreciation day is taking place at their museum. Batman and Black Canary are present, and Dinah resents how the old timers treat Batman like an equal, but still treat her like a little girl. We see some flashbacks to their time being trained, but soon the nostalgia is cut short when Nazi mad scientist Professor Z frees the evil Per Degaton, and gives him his Spear of Destiny. A pitched fight ensues, where the "old soldiers" of the Society must make one last stand against a foe from the past! I have already swallowed the hook on this show, but this episode ranks as one of my favorites. Just seeing the classics all up there, fighting Nazis and then still kicking it in the present, was tremendous. 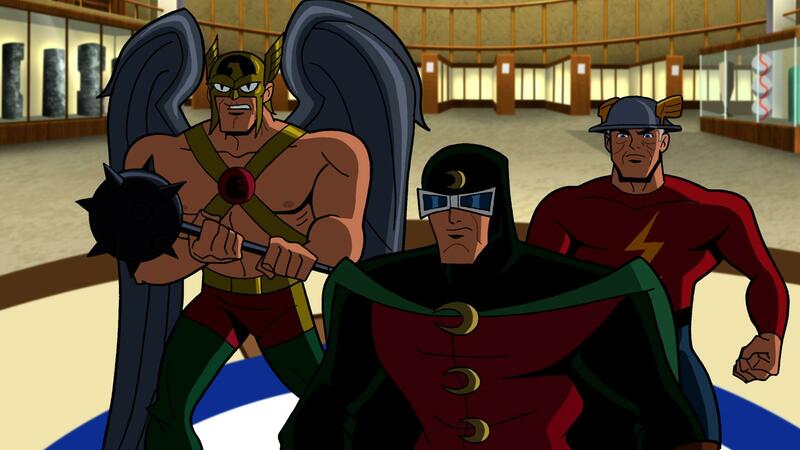 We've seen Wildcat a few times but it was really nice to see a good amount of time given to the classic versions of Hawkman, Flash, Hourman, and Dr. Mid-Nite, as well as a call-out to the Golden Age Black Canary. And Per Degaton, with his army of Nazi robots (who were juuuust shy of being emblazoned with the SS logo!) made for the perfect bad guy. Now, for the Hawk-related miscellania. 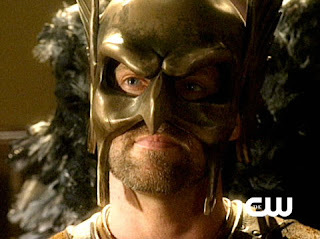 In the newsreel, as seen above, Hawkman is sporting a Golden Age style helm, with the beak, but in the modern day, his helmet has morphed to the more familiar style, as can be seen here. He wields his mace effectively, bashing through plenty of robotic goons. No mention is made of his origin, or how his wing harness works, but none of the Society get that in this episode, so that is not surprising. Hopefully, Hawkman can nab a starring guest star role in the future and more of these questions can be explored. Ultimately this was an excellent episode of TB&TB, further evidence that the Society has held on as long as they have because of the solid conceptual strength of its members, including Hawkman. Image: Screencapture from "The Golden Age of Justice! ", 2010, image retrieved from World's Finest Online. Episode #31 - The Golden Age of Justice! Summary: An armored truck carrying valuable pieces of art to the Midway City Museum is attacked by a tricked out motorcycle, which somehow causes the wheels to fly off the truck. When the drivers come to and find the paintings stolen, they are happened upon by Midway City Courier cub reporter Jed Barnes, who calls it in to the police. Barnes then heads to the museum, where he gets the story from Mavis Trent on the paintings (including a picture of the photogenic artist), whereafter Carter and Shiera Hall catch wind of the robbery. The Hawks meet with Commissioner Emmett, who gives them what little information they have. He also tells Hawkman that Barnes wants to interview him later. The Winged Wonders head out to investigate, and find an odd oil slick near the motorcycle's tracks, but little else in the way of leads, so they head to Eagle Valley to get the network of birds to keep sharp eyes open for the thief. The next day, as Hawkman is heading to police HQ for the interview, the birds tell him that the thief has been spotted, and he heads off -- finding the cyclist about to rob a payroll clerk with half a mil in his car! The Motorcycle Bandit is ready, though, and traps Hawkman in an artificial tornado generated from his tailpipe! He then uses an extemely bright headlight to blind the driver, causing him to crash. The Bandit dumps his motorcycle over the cliff and grabs the loot. Hawkman, trapped in the vortex, is only able to escape by skillfully tossing one of his boots into the tailpipe, clogging it. Tracking the oil slicks the Bandit left on the way out to the robbery, Hawkman finds him holed up in a small cabin. The Bandit readies his defense in the form of a small fan which shoots charged bolts of energy, but Hawkman notices the lights flicker and knows its a trap. Using the door as a shield, he busts into the cabin and grabs the thief, unmasking him as none other than Barnes, who had hoped to use his position at the paper to throw suspicion off of himself. Back at the Museum, Mavis vamps to Carter Hall about getting her picture in the paper, while Shiera rolls her eyes dramatically. 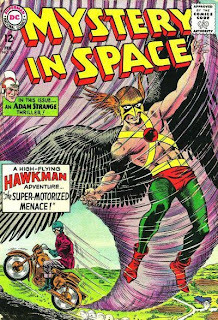 Review: It's a testament to Gardner Fox that he can take a silly idea like a punk with a sooped-up motorcycle and make him a viable threat to Hawkman for a 12-pager. I do have to wonder where Barnes got the know how to make all of these gizmos; the fanboy in me says that he is working for the I.Q. gang. Anyway, a nice solid but otherwise unremarkable Katar Hol story. We don't get any ancient weapons or Thanagarian science, but we do get to see the Hawks use their superior vision as well as the Midway City *wheet wheet! * network. Barnes himself makes for an interesting swerve, as your first thought is "Oh, they're giving Hawkman a Jimmy Olsen character," but Fox twists it. Murphy Anderson's Hawks have grown on me to the point where, while he won't be able to touch Kubert, his work is always welcome and eye-pleasing. This kind of story is, by definition, "minor" but these stories were very typical for the period and still fun to read today. Plus, Hawkman makes the cover. Image: Mystery In Space #89, 1964, Murphy Anderson. Not much in the way of Hawk-related stuff in shops this week (despite several Blackest Night tie-ins, I don't think either the Hawks or the Lovers will pop up in them), so let's take a look at some other DC offerings and see what looks intriguing or entertaining. Action Comics #885 -- I read the last issue of Superman, featuring the return of Mon-El in his new, Superman-inspired uniform, and it scratched an itch for me. I really enjoyed how Robinson handled the young hero and am eager to see how that continues in this issue. Batman: The Brave And The Bold TPB -- This is consistantly and effectively one of the most fun television shows I have ever seen, and this seems like the perfect jumping on point for the comic adaption. Outrageous! Flash vs Gorilla Grodd Mini-Statue -- Aww Yeah, Silver Age! I won't be buying this, but man, that's a neat piece. The Shield #5 -- Any comic which features a hero fighting giant Nazi robots in South America while fending off the national superhero team of China gets the nod in my book. 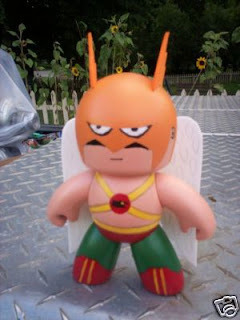 From the "never gonna see the light of day" department, check out this very cool custom Mighty Muggs Hawkman. I have never bought one of these guys before, although whenever I see the classic Iron Man I am tempted. They have a sort of goofy charm, especially in this day and age of more and more articulation and design work. Sort of an expressionist starkness, if you will. Image: Custom Mighty Muggs Hawkman, 2008, image retrieved from Custom Mighty Muggs. Title: "On The Eve Of..."
Summary: On Rann, Adam Strange breaks the group up into teams. He and Comet will ferry Starfire and The Weird out into space, outside of the forcefield, where they can Zeta Beam to Lady Styx and inform her about Synnar's ascendance. Then he and Comet will attempt to Zeta Beam to Earth for reinforcements. Meanwhile, Hawkman and the rest will find the generator Synnar is using on Rann. The plan falls apart quickly, though, once Comet teleports everyone into space. 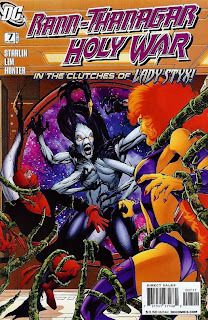 Synnar has placed a second force field in space, preventing the heroes from Zeta Beaming to Earth, and Starfire and Weird are immediately taken prisoner by Styx. Adam and Comet decide to investigate Synnar's satelite, since they can Zeta Beam there, and discover that it is a giant battery, draining nearly half a billion people of their life force to give Synnar the power of godhood. And this is only one of several thousand such satelites, meaning Synnar has trillions such poor souls in his thrall. On Lady Styx's flagship, Weird is able to slip through the guards and use his intangible hand to gran Styx's heart, forcing their release. The quartet meets up and heads back to the surface. On Rann, Synnar tells Deacon Dark that while the first step of his resurrection is complete, more is yet to come. Meanwhile, Hawkman has found the generator, and is prepping the team to take it out. He and Adam exchange information about their respective visions with Synnar, and Adam worries that whatever action he is taking here (including the mysterious "Plan X" he told Sardath to prepare for) will cause the ruin of Rann. With the team ready, Adam and Hawkman launch the assault which will either end the Holy War or destroy his adopted home. Review: The title of this story is very accurate, because we are in fact on the eve of armageddon in this issue. Starlin clearly is only interested in certain characters at this point (namely, the Abberant Six, Synnar, and his cronies), so the other characters (such as Animal Man and Starfire) come across as less than important -- even when they are front and center! But that is a result of the largish cast moreso than anything else, and since I like the characters which Starlin is focusing on, I don't mind so much. Lim's art is fantastic, as it has been this entire series. Sometimes you just get a really good match of artist and story, and this is one of those cases. His Hawkman continues to look powerful and imposing, with a large, off-putting helmet which seperates him from his fellow heroes. Everything just looks gorgeous, and his generous use of double page layouts, where there will be a two page splash to show the scale of something such as Styx's armada, overlayed with smaller panels, is really nice. This series is pretty much rocketing towards its finale at this point, and there's no crazy revelations or anything like we had in the previous one. It's still a good read, and fun sort of throwback cosmic comics. I wish it had more Hawkman in it, but that's the way things go sometimes. Image: Rann-Thanagar Holy War #7, 2009, Jim Starlin. Our sketch today is a commission piece by MD Bright, best know to me for illustrating Green Lantern through a good portion of the 90s. And like any good commission, it's a fight -- between the Winged Wonder and Marvel flying hero, "Snap" Wilson, AKA The Falcon! Considering I just got the Marvel Legends Falcon toy for Christmas, I thought this was appropriate. Bright's always had a clean, crisp style which I thought made him really well-suited to the DC heroes and this image is no exception. The wings are strong and dynamic on both characters, and both look suitably ripped. The details of Hawkman's costume are nice, including well-proportioned Honor Wings and a clean wing harness. I can't imagine how nice this would look in color! Although I am not happy with Falcon getting the drop on Hawkman, this piece still rocks! 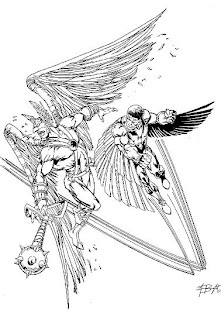 Image: Hawkman vs The Falcon, 2001, MD Bright, retrieved from www.mdbright.com. Here we have an DC House Ad for Hawkworld Annual #2 (which I picked up at Charlotte Comic-Con last year! ), hyping that issue's tie-in with the Armageddon 2001 event. 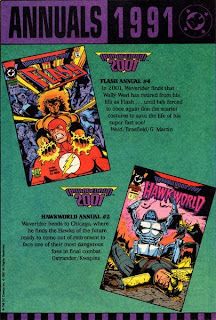 I have not had a chance to read this comic, because I haven't started with Hawkworld yet, but this ad would have made me want to pick it up back in the day. I got this ad from Dixon over at Crimson Lightning, which is appropriate since it also features Flash Annual #4. Needless to say I like this ad because it features my two favorite DC heroes! I miss Annuals for the most part. I like the idea of getting a big ole, oversized comic. DC has been slowly but surely reintroducing these, and hopefully that trend will continue. Image: Hawkworld Annual #2 House Ad, 1991, image retrieved from Crimson Lightning. Well, it doesn't look like we are getting anything overtly Hawk-related this week at our local comic shops, so let's take a look over the DC offerings and see what looks promising. Doom Patrol #6 -- I have really enjoyed this series, and the two part Blackest Night tie-in that just wrapped up was extremely strong. Giffen seems to be really enjoying himself handling the Patrol, and they are a good fit for his writing style. The feature consistantly has this looming mien of uphappiness and menace hanging over the preceedings, and frankly I think that is great. The Patrol should be the "weird" group, the misfits and freaks who don't fit in, and with Giffen amping up the "Anti Professor Xavier" vibe of Dr. Caulder, that foreboding bearing is perfectly suited to the team. I have never read the Patrol before this title, but I have fallen hard on this series. That and the Metal Men backup (which will be sorely missed!) is freaking hilarious. JSA All-Stars #2 -- The first issue was very well done, and the second looks promising as well. I was not really thrilled with the idea of splitting up the JSA, but this take seems like the best way to do this sort of thing. The preview pages reveal that Johnny Sorrow is bringing back the Wizard, Tigress, and Geomancer -- it's like we're back in the early days of JSA right here! Red Tornado #5 -- DC used to do minis like this back in the 80s, and I would like to see the trend continue. Characters like Reddy are worthy of attention and face time in places other than team books, and these minis are the perfect avenue for just that. This series has been very entertaining while fleshing out some of reddy's history and potential cast. We have an ally in Red Torpedo, a potential sidekick in Red Inferno, and a nemesis in Red Volcano. These may be obvious directions but sometimes the obvious choice is the best choice. Hopefully they will stick around for a while. So, you guys think anything else this week looks especially cool? Summary: Months after the events of the Shadow War of Hawkman, Katar Hol is plagued by nightmares, haunted by the Thanagarians he was forced to kill in their invasion attempt. The Hol's discussion about Katar's nightmares has to wait, though, when they receive a call from the new police chief to report to Midway City Museum to investigate a strange glowing energy field. When the Hawks touch the field, they find themselves in a strange wasteland, with giant misshapen beasts. The beasts are called poltergeists, and are formed from strong emotions in the space between life and death... or so they are told by the Gentleman Ghost! Hawkman's interrogation has to wait though, as they are then greeted by what appears to be the ghost of the recently deceased Mavis Trent, who has lured them here before moving on. The purpose of the lure? To set up an ambush by the dead Thanagarians! The Hawks fight but find themselves unable to get an upper hand on their foes. Eventually, the world starts to fall apart and they wind up back in the museum and the energy field disappates. Concerned for her husband, Shayera tells him about an old Thanagarian ritual her parents told her about, where the subject enters a trance and is able to help others "move on." Moved by her concern, Katar agrees to the ritual. The next day, while Katar is getting ready in Carter Hall's office, Shiera Hall has to shoo away the museum's new resident artist... who, unbeknownst to everyone, is actually a Thanagarian secret agent! But for now that remains hidden, and Katar flies to Grinder's Bluff, the former HQ of the invasion and the location where Fell Andar died. He calms himself, and enters the trance. In the trance, Hawkman again encounters Gentleman Ghost, who tells him that he is here to help his old foe and act as his spirit guide. The Ghost leads Hawkman to each of the Thanagarians in turn; some are angry with him, some just want to say goodbye, and some just need the release. But while he is helping his fellow Thanagarians in the trance, Katar's body is threatened in the real world by freshly animated rock monsters! As the geomorphic creatures are about to strike, Katar is saved by the intervention of his wife! A pitched battle ensues, in which the rock monsters are beaten back, and Hawkman and Hawkwoman fly off, ready to face the future. But back at Grinder's Bluff, Gentleman Ghost admonishes the spirit of Fell Andar, who animated the rocks, saying that the Hawks are his to play with, and his alone. Interesting also to note that this issue is the first one to definitively state that Gentleman Ghost is, in fact, a real ghost, and not a trickster or magician. Lord knows that DC would get some mileage out of that revelation over the years! Image: Hawkman Special, 1986, Richard Howell.